Background: A number of studies on Iranian nurses' job stress or job satisfaction are available. However, studies on the relationship between these two variables among Iranian nurses are rare. Objectives: This study aimed to investigate job stress and job satisfaction among nurses working in Kashan Shahid-Beheshti Hospital, and the relationship between these two variables. Methods: A cross-sectional study was conducted on 260 nurses with 1 year experience in nursing who worked in Shahid Beheshti Hospital in Kashan, Iran, during 2015. A three-part questionnaire was used including questions on demographic variable, the organization's performance satisfaction scale, and the 35 items hospital stress scale. Descriptive and inferential statistics were used to analyze the data. Results: Among the respondents, 65.7% were female, 82.7% were staff nurse, 68.9% had a bachelor degree, and 72.8% of the respondents worked in rotating shifts. The mean overall job stress and job satisfaction scores were 109.06 ± 16.22 and 129.03 ± 17.63, respectively. A significant correlation was found between job stress and job satisfaction scores (r = 0.30, P < 0.001). Married and unmarried nurses were not significantly different in job satisfaction or in job stress scores. However, the mean job stress score was significantly higher in female nurses than in males (P = 0.042). The mean job satisfaction scores and the mean job stress scores were significantly different in nurses with various degrees (P < 0.001 and P = 0.002). The mean job satisfaction scores were significantly different in nurses with different job positions (P = 0.042). Conclusion: Nurses showed a moderate job stress score and a moderate job satisfaction. A significant correlation was found between nurses' job stress and job satisfaction. Steps should be taken by the authorities to improve the nurses' working conditions and to decrease their job stress. Occupational stress is an emotional, cognitive, and behavioral reaction toward hazardous aspects of work and workplace. Due to the nature of their profession, nurses are constantly exposed to stress. Hence that after the low back pain, occupational stress is the second most common work related problems among nurses., Studies have shown that prolonged job stresses can not only reduce the quality of nursing care and patient safety  but also decrease nurses' job satisfaction, and increase their turnover. Job satisfaction is a multifaceted concept and different definitions of it are presented. For example it might be defined as pleasant or unpleasant employee's view to work, workers' perceived emotions caused by work experiences, expectations about work caused by real work experiences, and pleasure and enjoyment caused by work. Some intrinsic and extrinsic factors might affect employees' job satisfaction. The feeling of personal achievement and a sense of accomplishment and reputation are among the intrinsic factors. However, the extrinsic factors are related to the work environment and include salary, work benefits, working conditions, and available resources. Job satisfaction is a crucial factor in nurses' life which not only affects their productivity, professional and organizational commitment, morale, and turnover but also affects the quality of care and patient safety. Several factors might affect nurses job satisfaction, including a sense of being productive, type of tasks, opportunities for learning and creativity, a sense of pride in the profession, a sense of being recognized at his work, the ability to do teamwork, social satisfaction resulted from the workplace relationships, autonomy, physical environment, and security risks at work. Myhren et al. have reported that independent nurse prescribing would result in increased job satisfaction, but increases the nurses stress level. A number of studies on Iranian nurses' job stress or job satisfaction is available. However, studies on the relationship between these two variables among Iranian nurses are rare. This study aimed to investigate: (a) job stress and job satisfaction among nurses working in Kashan Shahid-Beheshti hospital, (b) the relationship between nurses' job stress and job satisfaction, and (c) factors affecting nurses' job stress and job satisfaction. The present study was a cross-sectional study, which was conducted in 2015 at the Shahid Beheshti Hospital in Kashan, Iran. The target population comprised of 600 nurses. In a previous study, 59% of nurses experienced occupational stress. Then, according to the following parameters, 229 of nurses were estimated to be required for the study (α = 0.05, P = 0.59, d = 0.05). However, we selected 260 nurses to compensate the possible attrition. Inclusion criteria included willingness to participate in the study and having at least 1 year of experience in nursing. There were no exclusion criteria other than un-returning the questionnaire. Samples were randomly chosen among all nurses worked in all units of Shahid Beheshti Hospital. First, a list of nurses worked in all units of the hospital was prepared. Afterward, the number of samples needed of each unit was calculated based on the number of nurses in each unit. Finally, the needed samples were selected randomly using the list of nurses in each unit. Researchers referred to the hospital units in different shifts, found the selected nurses and invited them to the study. If any of the selected nurses did not agree to participate in the study, another one was replaced using the same approach. When nurses agreed to take part in the study, the study instrument was given them, and they were asked to respond it carefully in a calm and private environment. Nurses were asked to put the completed questionnaire in a box that had been placed in the main lobby of the hospital. Questionnaires were collected from this box after 24 h.
A three-part questionnaire was used for data gathering. The first section included of questions on demographic variable (i.e., age, gender, marital status, education level, work experience, employment status, the usual working shift, working unit, job position, number of children, and financial status). The second part included of the organization's performance satisfaction scale. This scale includes 42 items for assessing the employees' satisfaction of the organization's performance. All items are scored on a 5-choice Likert format, from 1 = very low to 5 = very high. This scale produces the minimum and maximum scores of 42 and 210, respectively. Higher scores indicate higher levels of job satisfaction. The content validity of this scale was assesses by a number of faculty members in nursing faculty of our university. The reliability of the scale was also measured using Cronbach's alpha coefficient (α = 0.86). The third part of the instrument was the 35 items hospital stress scale (HSS-35). All items are scored on a 5-choice Likert format, from 1 = never to 5 = always. This scale includes eleven subscales including role overload/workload (5 items), role underload/role incompetence (4 items), role incompatibility/role conflict (4 items), role ambiguity (4 items), relationships with superiors (3 items), relationships with colleagues (3 items), shift work (2 items), physical factors (3 items), chemical factors (2 items), biological factors (2 items), and ergonomic factors (3 items). The mean score of each subscale reflects the amount of stress measured by the subscale. The HSS-35 scale has the minimum and maximum scores of 35 and 175, respectively. Higher scores indicate higher levels of job stress. The content validity of HSS-35 was previously confirmed and its reliability was measured using Cronbach's alpha coefficient (α = 0.84). The ethical considerations of this study were approved in the research Ethics Committee in Kashan University of Medical Sciences (ethical approval code: IR. KAUMS. REC.1394.98). Furthermore, necessary permissions were obtained from the authorities in the hospital and University. The aims of the current study were explained to all participants, and they were assured of the data confidentiality before start of the study, and all signed a written informed consent. To keep the confidentiality of the participants, anonymous questionnaires were used. Moreover, all the completed questionnaires are being kept in a locked box in the corresponding author's office. The researchers observed all ethical issues in accordance with the Helsinki ethical convention. Data analysis was performed using SPSS version 13 (SPSS, Inc. Chicago, Illinois, USA). Kolmogorov–Smirnov test showed that the distribution of the data was normal. Descriptive statistics (frequency, percentage, mean, and standard deviation) were calculated. Moreover, Pearson correlation coefficient was used to examine the association between job stress and job satisfaction. Analysis of variance and Tukey post hoc test were performed to compare the mean job stress and also the mean job satisfaction in nurses in terms of different education levels, working shifts, job position, and financial status. Independent sample t-test was used to compare the mean scores of the participants in terms of gender and marital status. The level of significance was set at below 0.05. A total of 254 out of 260 questionnaires were responded completely that signifies a response rate of 97.96%. Among the respondents, 65.7% were female, 70.1% were married, and 72.8% worked in rotating shifts [Table 1]. The mean age and the mean work experience of the participants were 32.49 ± 5.8 and 7.88 ± 5.26 years, respectively. No significant difference was observed between male and female nurses in terms of their demographic variable. The mean overall job stress score was 109.06 ± 16.22. The mean overall job satisfaction score was also 129.03 ± 17.63. 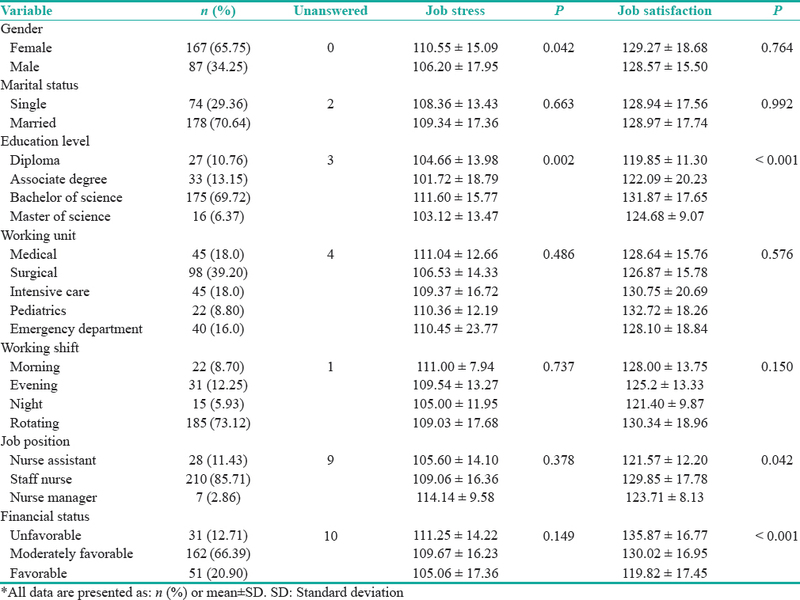 As [Table 1] presented, married and unmarried nurses were not significantly different in job satisfaction or in job stress scores. However, the mean job stress score was significantly higher in female nurses than in males (P = 0.042). Analysis of variance showed that mean job satisfaction scores were significantly different in nurses with various degrees (P < 0.001). Similarly, a significant difference was observed between the mean job stress scores in nurses with various degrees (P = 0.002). The Tukey post hoc test showed that the observed difference was mainly between the nurses with a diploma and those with a bachelor degree. On the other hand, the mean job satisfaction scores and also the mean job stress scores were not significantly different in nurses working in different units or in those worked in different working shifts. Moreover, the mean job stress scores were not significantly different in nurses with different job positions. However, the mean job satisfaction scores were significantly different in nurses with different job positions (P = 0.042). In addition, analysis of variance showed that mean job satisfaction scores were significantly different in nurses with weak, moderate, and favorable financial status (P < 0.001). The Tukey post hoc test showed that the observed difference was mainly between subjects with favorable financial status and the other groups. [Table 2] also shows that the mean score of job stress components was not significantly different in nurses with different positions. The overall job satisfaction and job stress scores were significantly correlated (r = 0.302, P < 0.001). Moreover, significant correlations were found between nurses' overall job satisfaction scores and their scores in several job stress subscales including role overload (r = 0.404, P = 0.001), role ambiguity (r = 0.349, P < 0.001), shift working (r = 0.177, P = 0.005), physical factors (r = 0.231, P < 0.001), chemical agents (r = 0.248, P < 0.001), and biological factors (r = 0.289, P < 0.001) [Table 3]. The mean overall nurses occupational stress and job satisfaction scores showed that nurses obtained about 62% of these scores. Furthermore, a significant correlation was found between nurses job stress and job satisfaction scores. These findings are consistent with some of the previous studies ,,,,, and confirm the relationship between nurses' job stress and job satisfaction. In the present study, no significant difference was found between married and unmarried nurses in the mean job stress and job satisfaction scores. These findings were consistent with reports by Ziapour  and Moein and Adib Hajbaghery. However, a study by Rodrigues and Ferreira showed that the level of perceived job stress is different in married and unmarried nurses. Some of the studies concluded that family responsibilities, financial issues and concerns related to children might exacerbate the effects of job stress in married nurses. However, another study cited marriage as a supportive and protective factor against stress and depression. In the present study, the mean job stress score was significantly higher in female nurses than male ones. This finding was in line with reports by Sahraian et al. However, the mean job stress was higher among male nurses in another study. The reason for this discrepancy may be due to the fact that in the Western culture, society, families, and work settings have similar expectations of both women and men; however, in Iran, the work roles are often are added to the family roles and the sum of the two would increase the level of stress in Iranian female nurses than male ones. In this study, the mean job satisfaction score was not significantly different between males and females. Inconsistent results have been reported regarding nurses' job satisfaction. Gholamnejad reported that job satisfaction is different between males and females. Asegid et al. and Ziapour have reported that job satisfaction is higher among male nurses than females., However, another study reported reverse findings. It seems that different factors such as gender, and cultural factors, the individual's role in the family and the family and job roles might affect nurses' job satisfaction. Perhaps, job satisfaction is more dependent on some work related variables such as work setting conditions, workload, type of responsibilities, and not on education level. In the present study, the mean job stress scores and also the mean job satisfaction scores were not significantly different in nurses working in different units or in those worked in different working shifts. These findings are consistent with the results of Sahraian et al. However, some of the studies have reported that working in changing shifts is associated with reduced job satisfaction  and increased job stress. Evidence showed that working in night shift is associated with increasing fatigue, changes in sleep patterns, and accelerated burnout. However, the insignificant differences observed in the current study can be attributed to the fact that nurses working night shifts for a long period might be accustomed to this type of working. The relationship between the type of working unit and nurses' job satisfaction and job stress also been confirmed in some of the previous studies., However, it seems that it is the nurses' workload and the conditions of work setting – not the type of unit – that affects their perceived stress and job satisfaction. In the present study, the mean job satisfaction score was higher among staff nurses' than that of nurse assistants and nurses managers. However, the mean job stress scores were not significantly different among nurses with different job positions and different income. Nonetheless, Mastaneh et al. showed that nurses' higher levels of job position and salary are associated with higher levels of job satisfaction. In the current study, the overall job stress scores and also its subscales of role overload, role ambiguity, shift working, physical factors, chemical agents, and biological factors were significantly associated with nurses' job satisfaction. Other studies have also reported that shift working, physical factors of the work environment, lack of amenities,, the managerial style of the direct managers, and the relationships between colleagues ,, are among the important work related stressors among nurses that affected their job dissatisfaction. The relatively small sample size and studying the nurses in one hospital might be considered as limitations of the present study that can reduce the generalizability of the results. Therefore, conducting further multicenter studies with larger sample sizes are recommended. Moreover, the study was a cross-sectional one. In a cross-sectional study, we cannot assess a definite cause and effect relationship. Nurses in this study gained a moderate level of job stress score and a moderate level of job satisfaction. Moreover, a significant correlation was found between nurses' job stress and job satisfaction scores. Therefore, steps should be taken by the authorities to improve the nurses' working conditions and work settings to decrease their work stress. Then, the nurses' job satisfaction and consequently the quality of care provided by them might be increased. Annual assessment of nurses' job stress and job satisfaction might be used as indicators for the patient security and quality nursing care. Due to the destructive effects of job stress on the people's mental health, interpersonal relationships, their efficacy in their job and on their job satisfaction, establishment of some counseling services for nurses to be used by them periodically or by need, can help them to manage their stress level and better management of their work problems. Moreover, in-service courses or workshops on stress management may help nurses to possess appropriate knowledge and skills on stress management. Then, they perhaps will tend to manage their job responsibilities more efficiently and deliver more quality care. Moreover, the establishment of a clear promotion system, involving staff nurses in making decisions related to the work setting and organization, and reeducation of nurse managers on managerial and motivation and communication skills, might be helpful in decreasing the conditions of nurses' work settings and increasing their job satisfaction. This study was granted by the research deputy in Kashan University of Medical Sciences (grant no. 9498). The authors are acknowledged of the research deputy and also of all nurses who participated in this study. The current study was financially supported by Kashan University of Medical Sciences, Kashan, Iran. Ghanei R, Valiei S, Rezaei M, Rezaei K. The relationship between personality characteristics and nursing occupational stress. Psychiatr Nurs 2013;1:27-34. Antigoni F, Pediaditaki O, Dimitrios T. Nursing staff under heavy stress: Focus on Greece: A critical review. Int J Caring Sci 2011;4:11-20. Poghosyan L, Clarke SP, Finlayson M, Aiken LH. Nurse burnout and quality of care: Cross-national investigation in six countries. Res Nurs Health 2010;33:288-98. Han SS, Sohn IS, Kim NE. New nurse turnover intention and influencing factors. J Korean Acad Nurs 2009;39:878-87. Castle NG. An instrument to measure job satisfaction of nursing home administrators. BMC Med Res Methodol 2006;6:47. Willem A, Buelens M, De Jonghe I. Impact of organizational structure on nurses' job satisfaction: A questionnaire survey. Int J Nurs Stud 2007;44:1011-20. Lorber M, Skela Savič B. Job satisfaction of nurses and identifying factors of job satisfaction in Slovenian hospitals. Croat Med J 2012;53:263-70. Asegid A, Belachew T, Yimam E. Factors influencing job satisfaction and anticipated turnover among nurses in Sidama zone public health facilities, South Ethiopia. Nurs Res Pract 2014;2014:909768. Murrells T, Robinson S, Griffiths P. Job satisfaction trends during nurses' early career. BMC Nurs 2008;7:7. Mastaneh Z, Mouseli L, Zamani M, Boromand F, Dadipoor S, Beizaei F, et al. Investigation of nursing job satisfaction in university hospitals affiliated to Hormozgan University of Medical Sciences. J Hormozgan Univ Med Sci 2014;18:283-9. Liu K, You LM, Chen SX, Hao YT, Zhu XW, Zhang LF, et al. The relationship between hospital work environment and nurse outcomes in Guangdong, China: A nurse questionnaire survey. J Clin Nurs 2012;21:1476-85. Moosavi-Tabar SY, Rahmani R, Sirati Nayyer M, Abbas Zadeh Z. Influence factors in job satisfaction of nurses in the selected military and civil hospital in Tehran; 2013. J Nurs Physicians Combat 2013;23-24:34-9. Rohi G, Asayesh H, Rahmani H, Abbasi A. Job satisfaction and organizational commitment of nurses employed in hospitals of Golestan University of Medical Sciences. Payesh Health Monit 2011;10:285-92. Gholamnejad H. Relationship of job satisfaction with demographic and job related factors among nurses in Saveh (2010). J Qazvin Univ Med Sci 2014;17:65-8. Khamisa N, Oldenburg B, Peltzer K, Ilic D. Work related stress, burnout, job satisfaction and general health of nurses. Int J Environ Res Public Health 2015;12:652-66. Myhren H, Ekeberg Q, Stokland O. Job satisfaction and burnout among Intensive Care Unit nurses and physicians. Crit Care Res Pract 2013;2013:1-6. Moein M, Adib Hajbaghery M. Comparison of occupational stress among female nurses and female members of the medical group in chosen training hospitals in Isfahan. Iran J Psychiatr Nurs 2015;3:1-10. Malliarou M, Sarafis P, Moustaka E, Kouvela T, Constantinidis TC. Greek registered nurses' job satisfaction in relation to work-related stress. A study on army and civilian RN. Glob J Health Sci 2010;2:44-59. Choi JI, Koh MS. Relations of job stress, burnout, mindfulness and job satisfaction of clinical nurses. Int J Biosci Biotechnol 2015;7:121-8. Nabirye RC, Brown KC, Pryor ER, Maples EH. Occupational stress, job satisfaction and job performance among hospital nurses in Kampala, Uganda. J Nurs Manag 2011;19:760-8. Rita AA, Atindanbila S, Portia MP, Abepuoring P. The causes of stress and job satisfaction among nurses at Ridge and Pantang Hospitals in Ghana. Int J Asian Soc Sci 2013;3:762-71. Hadizadeh Talasaz Z, Nourani Saadoldin SH, Taghi Shakeri M. The relationship between job satisfaction and job performance among midwives working in healthcare centers of Mashhad, Iran. J Midwifery Reprod Health 2014;2:157-64. Ziapour A. An investigation of the job satisfaction and related factors in nurses of Kermanshah hospitals. J Paramed Rehab Sci 2013;2:27-34. Rodrigues VM, Ferreira AS. Stressors in nurses working in Intensive Care Units. Rev Lat Am Enfermagem 2011;19:1025-32. McCarthy VJ, Power S, Greiner BA. Perceived occupational stress in nurses working in Ireland. Occup Med (Lond) 2010;60:604-10. Cho I, Ahn S, Kim SY, Park YS, Kim HW, Lee SO, et al. Depression of married and employed women based on social-role theory. J Korean Acad Nurs 2012;42:496-507. Sahraian A, Davidi F, Bazrafshan A, Javadpour A. Occupational stress among hospital nurses: Comparison of internal, surgical, and psychiatric wards. Int J Community Based Nurs Midwifery 2013;1:182-90. Khaghanizadeh M, Ebadi A, Cirati Nair M, Rahmani M. The study of relationship between job stress and quality of work life of nurses in military hospitals. J Mil Med 2008;10:175-84. Najimi A, Moazemi Goudarzi A, Gholamreza Sharifirad G. Causes of job stress in nurses: A cross-sectional study. J Nurs Midwifery Res 2012;17:301-5. Purgaz A, Nastiezaie N, Hezare Mogadam M. Job satisfaction of nurses working in hospitals in Zahedan. Bimonthly J Urmia Nurs Midwifery Fac 2010;8:138-43.